Unlike traditional organic farming that practices plowing, Farm of Ideas grow vegetables in permanent beds to disturb soil as little as possible. The two hectares of vegetable production is inspired by the market-gardening movement, and has a substantial higher yield than plow-based practices. Also, Farm of Ideas grow more than 65 different kinds of vegetables - something quite unseen in traditional organic practices. Every year compost is added to the soil to improve the microbial life that will aid the plants in taking up the right amounts of minerals and nutrients. This makes the vegetables more tasteful and even more healthy. Farm of Ideas’ small cow herd is made up of different breeds, mostly Jersey, but also Danish Red, Holstein and soon also Swedish mountain breed. To ensure less pain and stress, Farm of Ideas’ calves are not dehorned, unlike most other farms. Instead the farm secure enough space for them to keep their horns. Our goal is for the cows to pasture and thrive on a diverse and huge variety of grass, legumes and wild herbs - such as ryegrass, fescue, clover, alfalfa, chicory and lots more. This ensures milk of at least 5% fat and 4% protein, and a high proportion of the B-variant of the kappa-kassein gene, improving the strength of the cheese curd, which is important in mozzarella making - visit BÆST where you can taste the mozzarella, ricotta, and mascarpone, or at Mirabelle where they make yogurt, gelato, and much more with the raw milk. The cows are moved to new pastures twice a day, which allows the grass to recover and maximizes the carbon sequestration in the soil. To keep carbon in the soil the farm do not plow the pastures regularly as is normal practice, even with organic agriculture. Farm of Ideas is home to four sows of the Mangalitza breed. 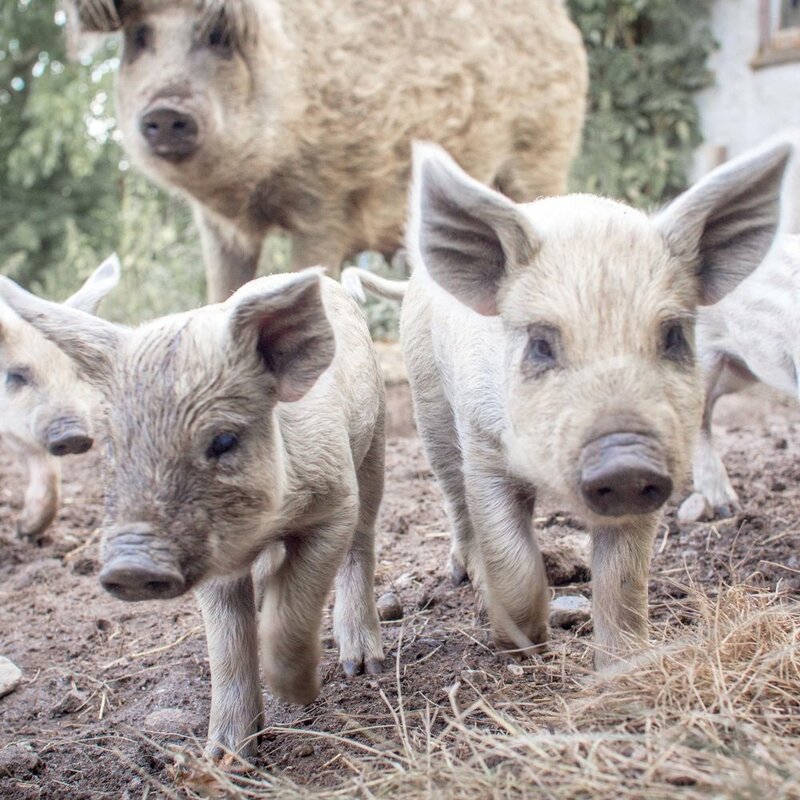 These peculiar looking pigs have a thick woolly coat, similar to that of sheep, and are a crossbreed between Hungarian breeds and the wild European boar - which is really noticeable by the stripes on the small piglets. The pigs are known for their high quality fatty, marbled meat, which makes amazing charcuterie and meat that you can taste at BÆST. Besides foraging for roots and insects, the pigs play a big part in the farm’s sustainability because they eat and recycle surplus vegetable, scraps and stale bread. But they also grass on pastures, where they love to eat grass - yes, pigs love grass too! Everyday the Farm of Ideas’ 200 Isa Browns hens lay about 180 eggs for Relæ’s, Manfreds’, BÆST’s and Mirabelle’s lovely dishes. Most of the year they live in the farm’s mobile chicken coop, from which they have access to a big area of pasture. The coop is moved once or twice a week, so the chickens are given a new portion of pasture to feast on. This means they always have access to bugs, seeds and green grass - a diet resulting in true orange yolks full of beta-carotene and healthy omega acids. The geese at Farm of Ideas are free range and graze inside a moveable fence, on the same fields as the cows. Here they do a great job of weeding the pastures, where they eat clover, grass and all the different herbs they can find. The geese have access to a drinking and swimming area and to prevent stress they are slaughtered locally to reduce the travel time. The meat from the geese will be used on the menus at Relæ, BÆST, and Manfreds. Happy birds and fantastic meat! The ducks at Farm of Ideas arrive when they are just one day old and are put out on grass after 4 weeks, where they thrive until they are 14-18 weeks old. Just like the farms chicken and hens they have access to a big area of pasture where they sleep, swim, have a active life and grow slowly throughout the summer. The meat from the ducks will be used on the menus at Relæ, BÆST, and Manfreds. 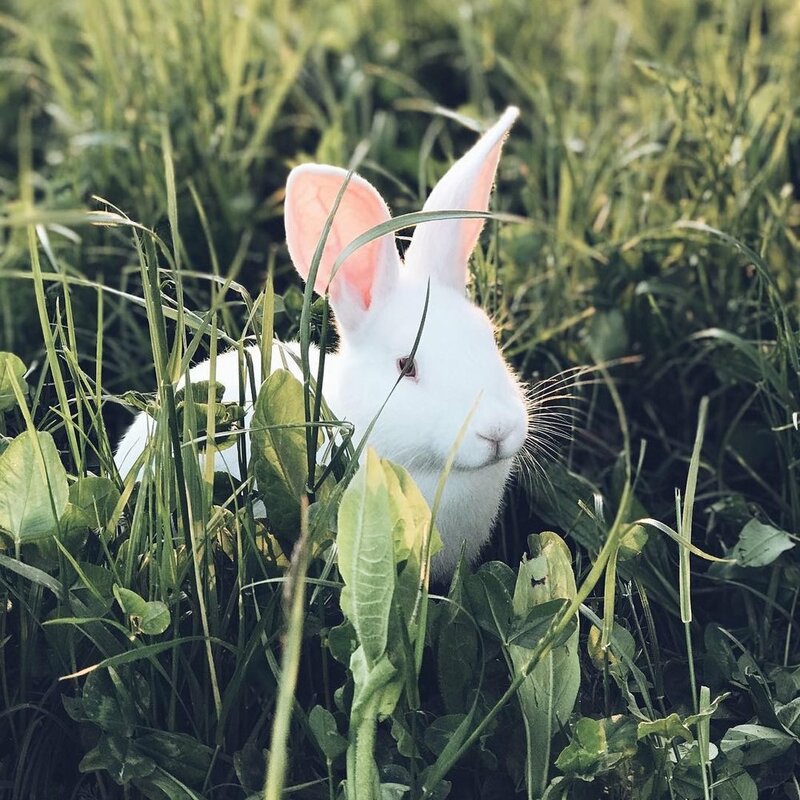 Breeding rabbits at Farm of Ideas started out as a small scale test program in 2018, to find out what it takes to raise a colony of rabbits and what challenges there would be in doing so. The first three does had three litters with around eight baby rabbits in each. From these litters the best females were picked out for further breeding. The rabbits are divided into several small colonies and live inside a moveable fence on the fields, which is moved to a new spot every second month. The rabbits are fed with surplus vegetables and greens from the farms fields and are slaughtered locally to prevent long transport hours.